Navy floral scarf with bright green foliage and multi-toned red and cream blossoms inspired the first two outfits above – dark wash jeans and a navy tank, topped first with a jade double-zip cardigan and then with the red linen jacket you’ve seen before. Obviously these mixes also work with navy ponte pants or pencil skirt. 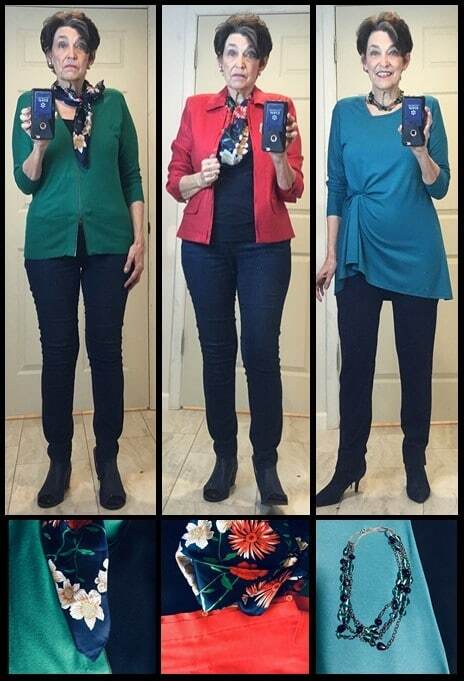 The necklace is the inspiration here – black and teal green beads suggested pairing a teal green tunic with black leggings. Two tricks to this outfit – read about the side drape effect HERE and the necklace modification HERE. This beautiful floral challis scarf (from my favorite resale shop – if you’re in St Louis you know the one!) links this dark teal sweater set back to any of my navy bottoms. And the same scarf works with black too – such a deal! Crinkle scarves give an outfit a slightly more casual look than my usual silky ones, so I used this one to link my pink shell and peplum cardigan back to deep berry cords. This could also work with my berry ponte pencil skirt or the lacy skirt from last week’s outfits, couldn’t it? Watch for a wonderful collection of these crinkle scarves in our web store soon. I can’t even think how long I’ve owned the sheer bandana scarf that inspired this combo, which gives me another way to use my royal blue skirt. Notice how this pump is cut out on the sides, leaving more skin exposed and therefore making my legs look longer. Even if you wear lower heels, the principle still works. This time it was the oversized hibiscus blossoms in the blouse print that supplied inspiration to link a basic black bottom to the red linen jacket. You can read a full analysis of how to work with an overly bold print HERE. 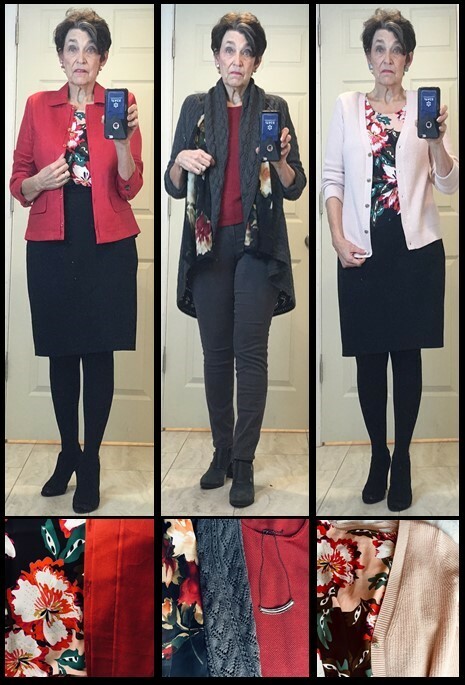 It’s worth noting that jackets and tops in the red family are especially versatile, since any woman’s best versions of red work with all her best neutrals, whether those are black, grays, taupes, browns, camels, navies or whatever. This long semi-sheer floral scarf is a great inspiration piece since it includes so many shades of “red” in the blossoms. And the sheer fabric softens the black background so it works equally well with this dark gray circle sweater and gray jeans. The shell is the under-layer of a twin set you’ve seen paired with navy and with chocolate brown in other outfits. After I snapped the photo I realized I could add the necklace – the silver/pewter version of a style you’ve seen me use before in the gold/silver version. It’s such a great basic it made sense to own both colorways. Even this blush sweater counts as “red family”. Its soft color given an entirely different feel to the bold floral blouse, doesn’t it? Blush is almost universally flattering, but it can be challenging to find. 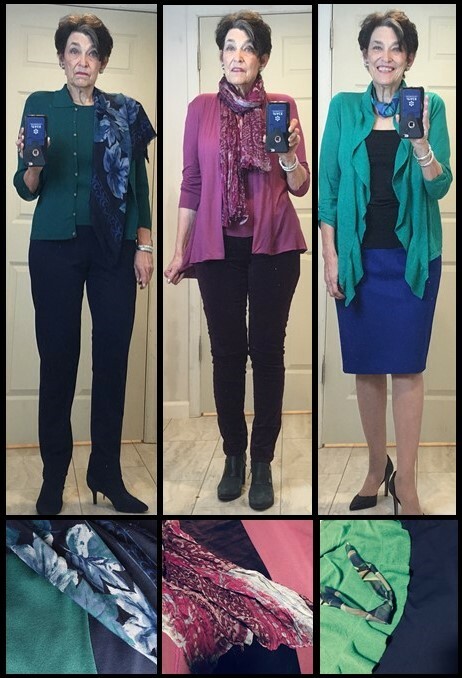 For our swing customers, we carry that color range in ponte knit, rayon/span jersey and a featherweight jersey with a subtle slub. Go take a look at your own scarf collection and see what new outfits they an inspire you to create. If you store them in a way that keeps them visible – not hidden away in a drawer – they can keep your creativity in overdrive every single day.